Anyone who has ever seen an episode of the 90s sitcom 'Full House' will know what Alamo Square looks like. 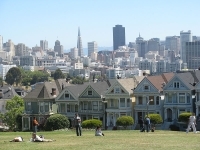 It is a residential neighbourhood and park in San Francisco, frequented by tourists, neighbours and dog-owners. The park features a playground as well as a tennis court. A row of Victorian houses overlooks the park, known as the 'painted ladies' and this view is often shown in the foreground of panoramic pictures of the city. On a clear day, the Transamerica Pyramid building and the tops of the Golden Gate Bridge and Bay Bridge can be seen from the park's centre. Alamo Square is a great place to get out of the car and have a picnic after a bit of sightseeing in San Francisco. Transport: Alamo Square is served by several Muni Bus lines including the 5, 21, 22, and 24.